Not Just Comedy Feb | A "Comedy Experience" that is never the same twice! 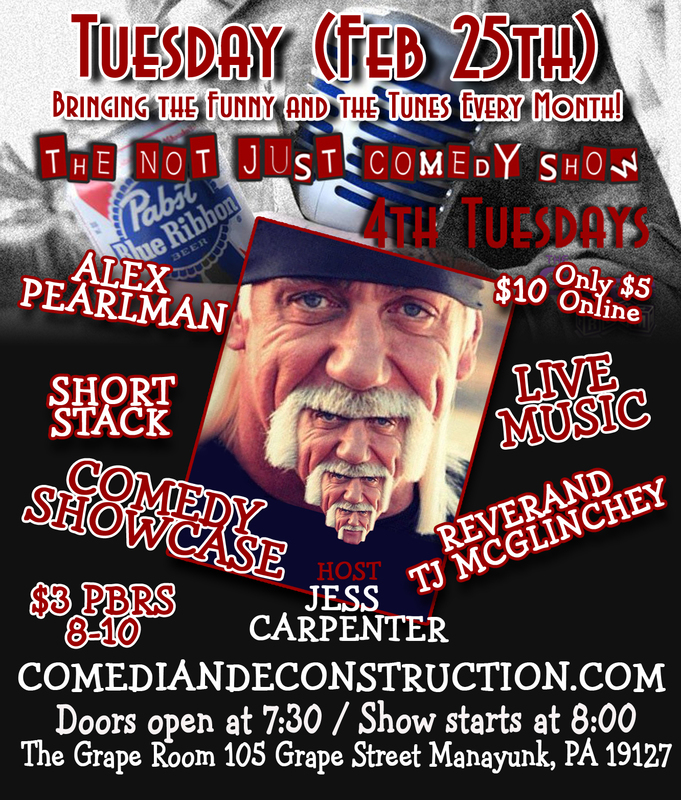 The Not Just comedy Show has Music and Stand up and so much more. We strive to book comedian together on the Show that will create a total show feel and then End it with Some of Philadelphia Best Singer Songwriters and This month is no exception. We have 2 comedians that are like 2 sides to a coin and I want to play off of the He Said She! Alex Pearlman is a rising star with a very Unique point of view and a way of sharing it! The Other Side of the Coin for this Show is Short Stack a comedian we have had recently and fell in love with Nerdy and Nice, Funny and Fierce all at the same time. Jess Carpenter is as usual the Host for the night and is there to make sure you all have a great time… and to end the night with a bang we are proud to have Reverand Tj McGlinchey!!! McGlinchey’s debut album, Tell Me To Stay, is strongly rooted in American folk music, but the Reverend’s diversity is evident throughout, whether in the bluesy “There Was A Time,” the vintage rock ‘n’ roll of “Little Red Car,” the reggae-inflected “Too Much,” or the pulsating Latin romp “Oye Bella.” A successful album release show at World Café Live in January, 2012 was swiftly followed by airplay on WXPN, cementing McGlinchey as one of Philadelphia’s hottest new recording artists. But this multi-faceted talent had already spent the previous ten years building up a reputation the old-fashioned way.